Africa RISING’s Kindu Mekonnen works for the International Livestock Research Institute in Ethiopia as a Crop and Livestock System Scientist. He was recently interviewed by the Ethiopian Herald newspaper on a range of topical issues. The interview covered a wide range of topics. Some of the questions included why Ethiopia has not been benefiting from its livestock sector though it is the leading county in the continent , what climate change adaptation and coping strategist are suggested for Ethiopia , the hot debate about hybridization, the role of research in the agricultural sector and some of the challenges he faced so far. Herald: Let’s begin with introducing yourself to our esteemed readers. Dr. Kindu: I was born in the north western part of Ethiopia, specifically in southern Gondar and I completed my primary and secondary school there in Debretabor. I joined Alemaya University in 1984 and graduated from the department of plant science in BSc. After graduation, I immediately joined the then institute of agricultural research and worked in the research system for more than 20 years. I have worked in the north eastern part of Ethiopia, central Ethiopia, in different research centres at various responsibilities. I was a centre director when I was in the eastern part of Ethiopia. I also have worked at Holeta research centre as coordinator of different national programs like integrated watershed management research program and the African highlands initiative project, which was operating in Ethiopia, Kenya, Uganda, Madagascar, Rwanda and Burundi. I was coordinating the project in Ethiopia. After that I went to Kenya for my MSc and I did my master of philosophy in agroforestry. Them I came back to Ethiopia and worked in Holeta. Later on, I went to Austria for my PhD and I did my PhD in natural resource management. I came back and joined the Ethiopian Institute of Agricultural Research (EIAR). After working there for three years, I joined the International Livestock Research Institute (ILRI), and have been working for the last five years. Now I am a crop livestock system scientist. I am working in a big project called Africa RISING, which operates in the highlands of Ethiopia. We are working in four regions and there are also other equivalent projects in Western, Southern and Eastern Africa. Herald: Ethiopia has a leading livestock resource potential in African continent. But it has not benefited to the level it deserved so far. What do you think is the reason? Dr. Kindu: As you said Ethiopia ranks first in terms of livestock population in Africa. But there are different challenges in the sector. One of the challenges is related to the feed resources. We are actually working on the feed part. If you see the national feed demand of the country still we are really deficient. So, feed is a major issue in our country’s livestock development. It needs a critical attention. Because of the feed shortage or in terms of quality and quantity, we are not getting what is expected from the livestock sector. The other challenge is the disease. As you can see in Ethiopia there are different animal diseases which are prevalent in various parts of the country. I think there are interactive issues that are affecting the productivity of the livestock sector. The issue of adequate market is the other challenge. 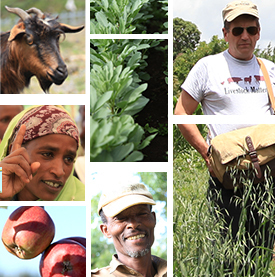 Recently, ILRI, in collaboration with EIAR, have developed a very good livestock development master plan. I hope with this master plan things will improve and the country may get better benefits. Even the type of breed that we are having is affecting our productivity. They give little amount of milk and meat as compared to the improved and cross breeds. We are counting the number but if we see the productivity, it tells us that the management system should be significantly improved. Herald: Climate change is posing a great challenge in agriculture in general and in the livestock sector in particular. Arid areas like Afar and Somali States of Ethiopia are highly affected by this that severe shortage of water and feed is prevalent in these areas. As a scientist in the sector what adaptation and coping up strategies do you suggest for Ethiopia? Dr. Kindu: There are different ways of adaptation with climate change. Different research organization and even the government is trying to address the issue. Climate adaptation and climate mitigation is one way. We are working more on the climate adaptation side. We are trying to develop different technologies that can help us adapt the different impacts of climate change. Works that we are doing, at present, are in one way or another contributing to the effort to adapt climate change. For instance, if we can have a very good feed species that can contribute a lot to adapt climate change. If we work on water harvesting technologies, it has also implication on adapting climate change. So, the different activities in agricultural research and extension can contribute a lot to climate change. Herald: Can you specifically mention these activities? Dr. Kindu: If we have a very good and improved crop variety, which can grow in dry-lands in short periods of time with small amount of rain, I think this is one way to adapt with climate change. If we grow trees, this also would have its own implications on climate change. All attempts by the extension and research sections in agriculture can contribute to climate change adaptation. The mitigation is at higher level when you work for instance on industrial emissions. The climate adaptation approach is important for Ethiopia as developing country. You can see the immediate impact. The mitigation can be more important for the industrialized and oil producing countries. Herald: What should be the role of the farmers in the process of trying to adapt climate change? Dr. Kindu: The farmers need to be trained and they should be well aware of the problem. I think they know it and have their own traditional ways of adapting with climate change. For example, if they grow a given crop this season and if it fails, they know how to successfully re-plant a different variety. They have a very useful indigenous knowledge. But we need to train them and make them more aware. They should be supported with reliable predictions. They also need to receive various technologies from the research and extension so that they can be ready and better adapt with climate change. But their indigenous knowledge is very important as they have been applying it for decades. So we need to understand their knowledge and we do not need to import technologies that are completely alien to them. We must first know what they have and it is possible to capitalize from that. Herald: Is there a way that research can make animals and plants easily adapt to climate change? Dr. Kindu: There are breeding systems that are creating a species that can easily adapt to climate change. For instance, I have seen in western Kenya improved varieties of goats who are giving a lot of milk and who have a very big body weight. Poultry in our country can easily adapt to climate change but their productivity is very low as compared to the improved ones. So, there are ways to bring improved cows, goats, sheep, and poultry. Herald: In relation to the issue of hybridization, there is a hot debate between people who stand for and against this idea. Some scientists propose that, improving the local variety as i is, without any mixing can make them easily adapt and give better nutrients to the people who consume them. On the other hand, when they are hybridized they give more products in terms of meat and milk but with less nutrition. Is there any way that we can reconcile these two sides of the debate? Dr. Kindu: You are right. We really need to reconcile these two issues. We shouldn’t be emotional on this matter. If we see something that works well in some countries, we shouldn’t bring it as it is and make it practical all over the country. It is good to test it in a given area and see its compatibility carefully. As you said we are in some cases we are focusing more on introduced technologies and we forget our local ones. This way, we may lose many of our vital indigenous resources. We need to be careful and balance and see how we can really reconcile these two issues. We also need to have a conservation mechanism. You might have heard what happened to the Fogera breed. I was grown in that area and when I was young it was possible to get around eight litres of milk per day from this breed. But now because of the hybridization made on this breed, we are losing the indigenous breed. There is no pure Fogera breed now in the area. So, we need to be careful. When we bring something from outside we should first see where we can test it, where to use it and how to maintain our indigenous breeds. It can be of any crop variety or livestock species and we shouldn’t undermine the importance of our indigenous resources. Herald: In view of the huge livestock potential that we have, do you think that the sector has been given a fit emphasis as compared to crop agriculture? Dr. Kindu: I think this is really a big issue. It may be due to the fact that the government has its own emphasis and it may also be because those crops are short term agriculture. We see its impact within short period of time. We also have to take into consideration the status of our country. Due to this and other factors, the government may be giving more priority to the crops. As you said the livestock sector did not receive much attention as compared to the crop sector. Even when I was working with the research institutions, I can see how much budget is allocated for crops, livestock and natural resources. Even the number of people who are trained in crop, livestock and natural resource shows the disparity clearly. In the case of the natural resource and livestock, sometimes you do not see the impact directly or with in short period of time. Even some of the researchers are frustrated to be part of the livestock sector or the natural resource research system. As it takes time you may not get the opportunity for your further studies. There was no balanced attention for the three sectors. But it doesn’t mean that we are blaming the effort. It may be because the government wants to see immediate outcomes that can remedy the problem of food insecurity. We were voicing for the natural resource sector be given due emphasis and now it has its own ministry. A separate research institute is set up for forestry. So, there are some indications now that the sectors are getting more emphasis. Herald: What are the specific activities you are engaged on in your stay with ILRI so far? Dr. Kindu: It is five years since I joined ILRI. I was working in five different projects. The first one was focused on livestock intensification project at a global level. Then there was the Nile Development project. There is also the Africa Rising project. Now I am fully engaged in the Africa Rising project. It is mainly aimed at research in sustainable intensification for the next generation. It is based on the USA’s feed the future initiative. We are working now on the Ethiopian highlands. We are working in Southern, Tigray, Amhara and Oromia States. We have selected one Woreda in each region and we have almost contrasting research Kebeles in each Woreda. One may be close to market and the other may be far from market and road access. It is a big project and we are working more on intensification. I think it is in line with the government’s effort. Intensification means you produce more with some units of inputs. With a small piece of land, you produce two to three times and improve the productivity of the land. Our project covers everything. It has livestock, water, forestry, and crop components and we have around seventeen thematic areas. We are working with nine international research centres and about four universities in Ethiopia and the regional and federal research institutions. So, we have a very good relationship with different stakeholders. It is a five year project and we are now on the third year and we are expecting another five years of extension. Herald: In relation to the issue of food security in Ethiopia, what do you suggest to successfully ensure food security in the country? Dr. Kindu: Of course, one of the big objectives of this Africa RISING program is to contribute on food security and improving income of smallholder farmers. We also give due attention for the youth and women groups. If we work hard, I do not think it will be difficult to be food secured. The extension, research, learning institutions, farmers and other key stakeholders have to work closely. We also need to have good technologies and practices that farmers can access easily. We should also work on the capacity building aspect of the farmers, researchers and instructors. If we do so, I do not think it will take much time to be food secure. It is a matter of working together and commitment is really very important. I was in Tigray two weeks before and I have seen how one person brought a huge change in his area called Abraha weatsbeha. We have all the resources but we are not using them adequately. For instance, the water resources are flowing throughout the year with no or little use. Herald: You have a very long experience in the area of research. Many of the researches in our country are shelved without solving any problem. What is your view on this specific to the research experience in agriculture? Dr. Kindu: Sometimes our approach is wrong. Actually, there is a revolution now. In former times research was criticized for not participating farmers and other stakeholders. But through time the approach has changed. I think every partner should be participated in the research. In addition, we should cluster issues that we want to address. We should also cluster the farm types as we have diversified types of farmers. Some farmers have the resources while others are devoid of them. Some others are situated in the middle stage. We were using such a blanket approach in contrast to this reality on the ground. For example, when we get one technology, you advise every farmer to use it. I think that is a wrong approach. That is why clustering is necessary to meet our target. We need to target and identify where to exactly use the technologies instead of randomly advising all farmers to use it. If the farmer is engaged in crop and you provide him with livestock technologies, the farmer can not be interested to apply it. You need to know what is needed for the farm and the landscape in general. Participation of the farmers also matters most. Sometimes we focus more on the production when we hardly follow the value chain approach. You produce a lot but if you do not have the market, this discourages farmers. In a value chain approach, you work on the input, processing, production, storage and marketing parts. If these things are interlinked we would not fail. So, we need to see different approaches. Herald: As human beings, we may face many challenges in our personal life. What was the most challenging moment in your life? Tell us also how you managed to overcome it? Dr. Kindu: The challenges in life may be many but I can mention one major challenge among them. While I was working with the African Highlands Initiative Project, we wanted the landscapes to be changed. We wanted the upstream parts of the watershed to be covered with trees via different interventions. We tried to discuss the issue with the farmers several times. But they resisted us firmly. Finally, we decided to take the farmers to the Konso area in Southern part of the country. We left them free to interact with the farmers in that area. We also took them to Derashe and Northern Showa so that they see the soil and water conservation in those areas. When they came back they were really excited. So they tried to identify one landscape and do soil and water conservation by themselves. There were a lot of challenges that it took up to three years to convince these farmers in such a way. So it is sometimes good to look for a very good entry point. As a researcher, if I am working on natural resources, or crop or livestock, we should look for some ways outside the area to tackle when we face such challenges. That can serve as an entry point. As a project coordinator I was really frustrated when we faced such a strong resistance. The report is very good. That is the key way to solve the country’s problem.